Here we have Canine Caviar, a premium pet food brand that refers to themselves as the only company that creates alkaline dog food. According to the company, the benefit of an alkaline based diet is a proper pH balance that helps oxygenate the blood and reduces cellular degeneration. This process is supposed to lead to longevity and overall better quality of life in our dogs. They lead on to say that a wolf or wild dog would always eat an alkaline diet because when they consume the blood, intestines, and spinal fluid of their prey they are taking in a lot of those alkaline rich materials. We’ll get more in-depth about how an alkaline-rich diet could help your pup live a longer healthier life. Continue reading for more! The story of Canine Caviar starts twenty years ago with a man named Jeff Baker. He was working for a pharmaceutical company as a researcher at the time, and he had a Great Dane that was suffering from a variety of health issues. His dog was allergic to bees, ants, spiders, and almost everything so they were frequenting the animal emergency room. Once he switched his pup to an all-natural holistic diet, he noticed he no longer had an allergic reaction to all those bites. From there he later realized the benefits of an alkaline diet and his Great Dane lived to be 17 years old, the second longest living Great Dane in history. He says that alkaline dog food is different than anything else because it puts more oxygen into the blood and allows the DNA’s self-recovery mechanism to work more effectively. This results in longevity due to the reduced risk of kidney and liver problems. What Types of Dog Food Does Canine Caviar Offer? The company offers a wide variety of dry and wet foods plus many different dry chew treats. Not all their foods contain meat as the first ingredient, but they are all said to balance the pH levels for your dog. All their foods contain a limited amount of ingredients with one meat as the primary source of protein. They believe that a dog’s body and urine should be alkaline which is above seven on a pH scale. For this to happen, Canine Caviar must carefully select herbs and ingredients and process them in a particular way that maintains a specific alkaline level. They don’t go into extensive detail about this process, so we’re not exactly sure how they do it. Canine Caviar flash cooks their foods for only six seconds, and they say that helps them lock in the nutrients and maintain the flavor and integrity of the proteins. This process allows your pup to absorb the vitamins and minerals quickly and it makes the food more digestible for them as well. During our research, we did not find any recalls of Canine Caviar Dog Food. However, you should stay informed by checking their website for new information relating to recalls. In this section, we’re going to break apart everything you need to know about some of the most popular food lines from Canine Caviar. We’re taking a look at the ingredients, nutritional values, and reputation from customers who have already tried the food. 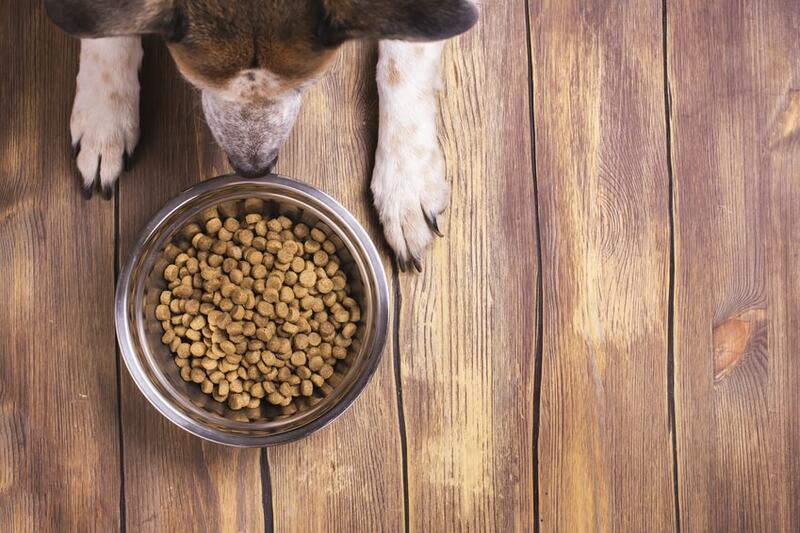 This food is a balanced diet that is intended to help dogs who are overweight or aging. The formula provides everything your dog needs to get the proper nutrition free from chemical preservatives, by-products, GMO’s, glutens, BHA, and BHT. This specific line contains limited ingredients including one protein from dehydrated meat that is free from hormones, pesticides, and antibiotics. Our only concern with this food is that it does not contain protein as the first ingredient. We typically like our foods to have real meat before grains and starches but based on the 4.5 out of 5-star rating we’re not too concerned. Many of the critical reviews of this food express concerns over product changes. It appears that the company changes the formula frequently and each time they have a different appearance and smell once their dog gets used to the food, they have to acclimate them to it again. The positive reviews state that the formula made a significant impact on their dogs’ quality of life and it helps with many different health issues. If you have health concerns for your furry friend and you feel like you are out of options, we highly recommend giving Canine Caviar a try. This is food for moderately active or nursing dogs. The food contains no preservatives, by-products, GMO’s, gluten, BHA, or BHT. They use a single protein and carbohydrate from fresh, dehydrated meat to limit possible allergies or negative reactions. The Open Sky blend is nutritionally optimized to help support muscles, organs, bones, and teeth. Some reviews of this product have said that it helped with sensitive stomachs and dogs who have trouble with vomiting. The ingredients for this food contains meat as the first ingredient which is great, and the nutritional breakdown contains a higher protein and fat content so we would recommend this food for a more active dog. If your pup is sedentary, they may gain weight from eating this formula. Overall, most of the food brands from Canine Caviar have an excellent reputation of four stars or more. We noticed the reputation declines a little as you look at their treats. Some of the treats they have bad reviews centered around a strong odor. Customers who purchased the chewing sticks also say they don’t last long enough, so they aren’t worth the money. Some positive reviews of their popular dry kibble brands say that the food is a life saver and it has worked unbelievably well for their dog’s health issues. Pet parents say the food works great for allergies, pancreatitis, urinary crystals, hotspots, and a whole slew of other health complications. Here are some reviews from real customers who purchased Canine Caviar. Our nine-year-old American Bulldog has had cancer surgeries and is suffering from the onset of early stage kidney disease (possibly partially due to the meds he’s required to take post-surgery). He’s also, characteristic of bulldogs, suffered from skin allergies that manifest themselves through itching, muzzle breakouts, brown spots, etc. The best thing you can do for your pup when their health is struggling is to consult with your Veterinarian. If you’re looking to try something new and different Canine Caviar is a good option. This dog food helps your pup maintain a proper pH level to help put more oxygen into their blood and regulate their digestive health. According to reviews from customers, the food helps with a wide variety of other health issues as well. If you feel like you’re out of options, we definitely recommend giving Canine Caviar a try if you want something a touch more elegant than what your dog is accustomed to.